But her speech at an annual banking conference puts her at odds with the president's deregulation mandate. JACKSON HOLE, Wyo. — Federal Reserve Chair Janet Yellen on Friday emphatically defended the web of regulations the Fed helped enact after the 2008 financial crisis, saying it helped restore the banking system’s health and disputing criticism that the rules have hurt lending. Yellen said the Fed is prepared to adjust the regulations as needed to help financial institutions. But in a speech to an annual conference of central bankers in Jackson Hole, she implicitly rejected efforts by Republicans, including President Trump, to scrap the 2010 Dodd-Frank law as a threat to the economy. 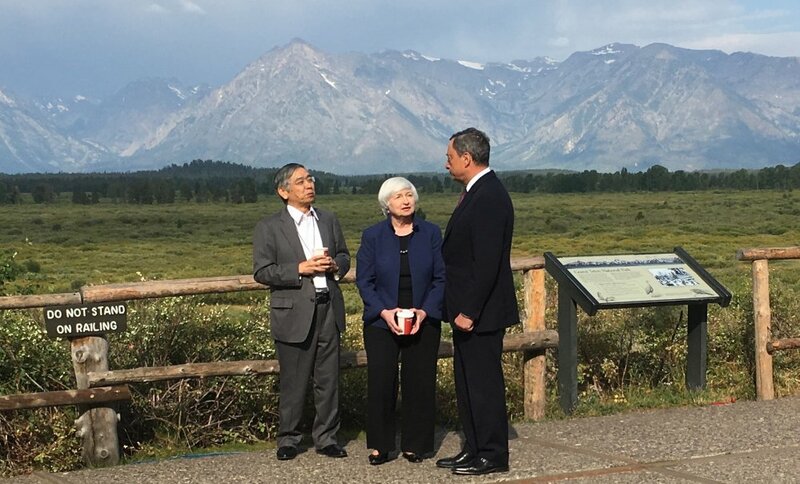 Overhanging Yellen’s speech was the possibility that it marks her final appearance in Jackson Hole as Fed chair. Her term as chair will end in February, and Trump has made clear he is considering replacing her. One candidate he has mentioned is Gary Cohn, a former Goldman Sachs senior executive who leads Trump’s National Economic Council. Some saw Yellen’s forceful defense Friday of the regulatory structure imposed on banks since the 2008 crisis as further lessening the likelihood that Trump will reappoint her. Paul Ashworth, chief U.S. economist at Capital Economics, said that “Yellen’s passionate defense of the post-crisis tightening of financial regulation isn’t going to go down particularly well at the White House” and that it probably makes it less likely that Trump will re-nominate her. At the same time, tensions might be arising between Cohn and Trump. In an interview published Friday in the Financial Times, Cohn said he considered quitting the White House over the president’s widely condemned response to violence at a white nationalist rally in Charlottesville, Virginia. Cohn said he ultimately chose not to leave because of the duty he feels to his job. A few hours after Yellen’s speech Friday, Mario Draghi, president of the European Central Bank, told the Jackson Hole conference that the global economy is strengthening but warned that countries must work together to resist a growing backlash against open trade. He said multilateral cooperation is crucial to reassuring workers who worry that free trade puts their jobs at risk. In her speech, Yellen noted that the U.S. and global financial systems were “in a dangerous place 10 years ago,” with severe strains that led to the collapse of investment bank Lehman Brothers, the government takeover of mortgage giants Fannie Mae and Freddie Mac and the requirement that taxpayers bail out the largest banks. She said the Fed is open to modifying current regulations, especially to ease restrictions on smaller banks that didn’t contribute to the 2008 crisis. She also suggested that the so-called Volcker Rule, which limits the ability of banks to trade their own investments, might need to be modified. “Our more resilient financial system is better prepared to absorb, rather than amplify, adverse shocks, as has been illustrated during periods of market turbulence in recent years,” she said.